I was vomiting a bitter yellow fluid. I knew I was in trouble but couldn’t do anything about it. The air was crisp and cool. The sun was still hidden behind a mountain ridge. It was not yet 5AM. My head was spinning and I couldn’t see straight. It was the early summer of 2014. After returning to the USA after over 6 months of travel abroad, one of our first stops was Yosemite National Park. My wife and I are avid outdoorsmen. We trail run, hike and bike all over the place. What better way to kickoff our cross-country road trip than with a four-day backpacking adventure in the Yosemite high country? Unfortunately, the altitude hit me. HARD. The hike started with a long and sun-baked 4,000 vertical foot ascent out of the Yosemite Valley with a heavy pack on my back. I felt pretty tired by the end of the day. We set up camp in the shade of some tall Douglas Fir trees. By the early hours of the morning, my head was spinning and it was obvious that I had succumbed to altitude sickness. Luckily, my wife had the presence of mind to kick me out of our tent. She thrust a 2 liter bag of water into my hand, and pointed me down the trail. My vision blurred. I stumbled down the trail like I was drunk. After descending about 1,500 vertical feet I felt better. My mind cleared and vision returned. We opted to abort our hike. Later that afternoon we arrived at the parking lot. I felt terrible, but was coherent. That experience made me appreciate the mountains. It taught me a level of respect for them I hadn’t had before. It also made me want to go back and redeem myself. Later that year, in September of 2014, we would have a chance to do just that. My wife and I hiked the 220-mile John Muir Trail (JMT) over the course of 18 long days. One of countless EPIC views from the JMT! This was the longest backpacking trip I’d ever done. It was also the toughest, and most beautiful. You can learn a lot about yourself and about life over the course of 18 days of relative solitude, hiking over 13 mountain passes. Much of the JMT is remote. There is no easy way out of the mountains should disaster strike. This means every hiker needs to be aware of their own abilities, inabilities and prepare for the worst while hoping for the best. You cannot go out into the wild without taking full responsibility for your own safety. Pack the required emergency supplies and learn how to use them. Become familiar with basic first aid and pay attention to your surroundings. The later will help you if you get lost. By better preparing yourself for an emergency, you will be in a position to help others should they need it. When I was working at Microsoft, my days filled with meetings. There were times, particularly in the early mornings, when I would go out of my way hide from others. I would camp out in an empty conference room or cafe to avoid people pinning me with questions during office drive-by’s! I did this so I could get my work done in peace and quiet! Out on the trail, it is a different story. After a few days in the back country, the inner craving for human contact grows strong. I found myself saying “Hello” to people more often. I went out of my way to remember people’s names and strike up casual conversation. These conversations would result in helpful info. Info like the best campsites to snag, location of good water sources, off trail views worth hiking to or the status of free goodies at the next “hiker barrel”. I wasn’t friendly just to get helpful tips, It just seemed a lot more natural out on the trail and away from the demands and distractions of everyday life. Alpine lakes galore! 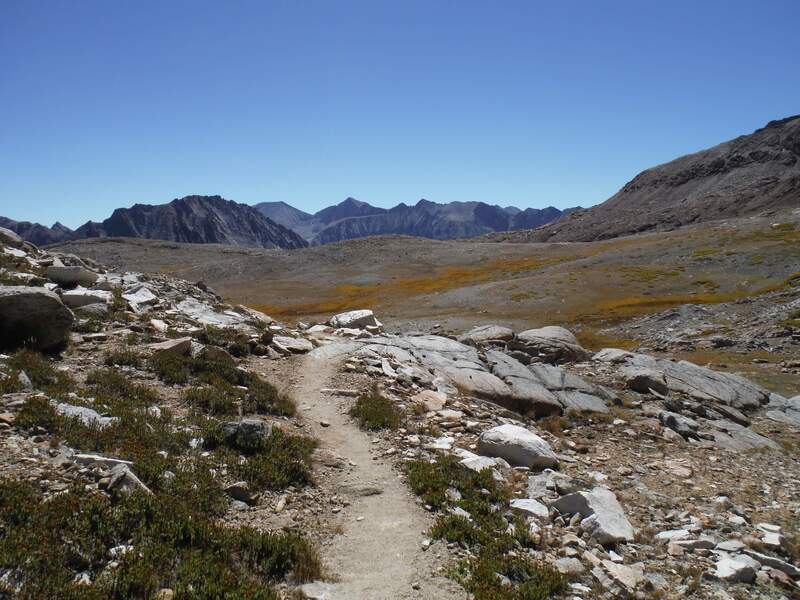 Many accessible only by hiking the JMT or connecting via multi-day spur trails to the nearest trailhead. I have written in other posts about how important it is to take care of your health. On the trail, this means catching small problems before they turn into big problems. Spot the small blister and treat it before it becomes unbearable. Soak your legs in an icy cold stream every night to support recovery so you don’t tear something. Keep your gear in good working order. Use duct tape liberally to reinforce and repair things. I passed one hiker who didn’t pay attention to a small blister, until it become so large he was literally unable to walk. I’m pretty sure he ended up abandoning his JMT hike early, less than 70 miles into the 220 mile adventure! Halfway through the JMT I came to the Vermillion Valley Resort (VVR). This oasis and popular stop for hikers along the JMT or Pacific Crest Trail (PCT) had a nice cafe, general store and a variety of accommodations to be had. It is a bit off the JMT trail, but worth the extra miles. My original plan was to just camp there for the night and continue on my way the next morning. Out of curiosity, I asked if they had a vacancy – and it turns out they did. They had a Yurt for rent. This Yurt was deluxe, with a soft queen bed and full kitchen! I splurged the $90 USD for the Yurt, and it was one of the best nights sleep I’ve ever had. The micro-brews and hot French fries from the cafe didn’t hurt either. Sometimes, you just have to treat yourself! After a few days in the bright hot Sierra sun, I felt healthier than ever. Humans are built to live outdoors. Even in the grim skies of the Pacific Northwest of the USA, a day spent outside will provide enough exposure to the sun to help your body take the solar energy and do amazing things with it. Sunshine does more than just support your body’s production of Vitamin D.
The problem with modern society is that people confine themselves to indoor offices during daylight hours. and commit to taking frequent walking breaks outside. Fresh air, combined with proper nasal breathing, can completely change your energy level. If you live in an urban environment, get as far away from the city as you can on the weekend. Get outside and go hiking! For most of the 18 days on the JMT, I was completely disconnected from the Internet. What was bizarre is the strange impulse I had to “check-in” to my networks during the first few days of the hike. Over time, this impulse quieted. 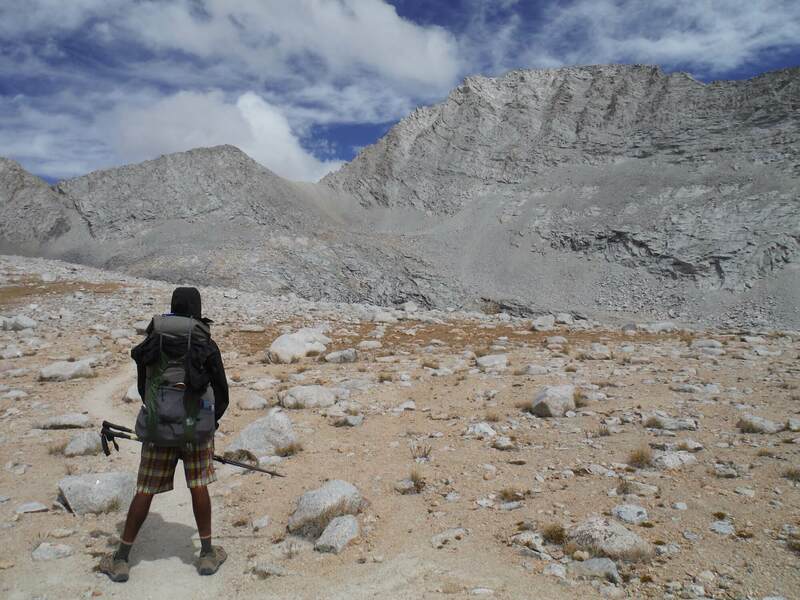 After finishing the hike, and gorging on some vegan pizza in the small village of Lone Pine, CA – I did get back online. Guess what? I didn’t miss a thing! both amazed and confused me. How can I commit to living in the present moment, but still do the planning needed to achieve big things in my life? It turns out, that planning is a key part of living in the moment. The distinction is that there is a time for planning and a time for living in the moment. Our challenge is to have the discernment to know when is the right time to plan vs just be present. The JMT requires a ton of planning. Planning food drops. Permits. Gear. Travel. When done properly, this planning allows for more relaxation and presence on the hike itself. So when it is time to plan, be present in “planning your work”. Then, be present and live in The Power of Now as you “work and live out your plan”. We had great weather most days on our JMT hike..look at the blue sky! Much of my hiking was at a snail’s pace. I couldn’t help it. During the long uphill portions, a snail’s pace was all I could muster. On the downhills, I went slow to enjoy the views. The JMT taught me to enjoy hiking slow. After all, I was hiking through the most beautiful terrain in the country. Maybe the entire world. I hiked the JMT going from North to South. This means starting in Yosemite and ending in at Mt. Whitney. With this route, the last three days of the hike are the toughest. When my wife and I got to the final 60 miles of the trail, we picked up our pace. We were hungry for fresh food. We were longing for a soft bed. We missed our dogs (who were staying at a kennel during our trip). We decided to put in longer days and finish in 18 days instead of 19. Sometimes, you need to find your inner ability to hustle. This hustle will come in handy when you need make it over a mountain pass before a storm moves in, finish that project before a deadline hits, or just make it to your gate before the plane takes off. My parents would describe my JMT adventure as torture. To me is was fun! Even the discomfort of hiking 13 rugged miles a day (at altitude) become quite easy by the second week of the hike. By the end, I was hiking 16+ miles a day without too much trouble. The human body and spirit is adaptable. But, yet, it takes repeated stress to create this adaptive effect. Whatever you are doing, if you can become comfortable with discomfort, the discomfort will become comfortable! Nature’s stair-master. The world’s best fat burner is hiking over mountains! I lost 16 pounds during my 18 day JMT hike despite eating as much as I could. That’s right, 16 pounds while stuffing my face! To be more clear, based on my own visual assessment (and my wife’s!) those 16 pounds were all FAT! How is it possible to lose 16 pounds of fat in 18 days? Step 1: Carry a 20–30 pound backpack. Step 2: Hike for 6–8 hours a day at altitude over rugged terrain. Step 3: Eat 2500 calories a day or less (if you are a 160lb male). Viola! 16 pounds of fat – GONE! While I tried to eat more than 2500 calories a day, I just wasn’t hungry to eat more, so I didn’t. The best part? I’m writing this post 7 months after completing the JMT, and the weight is still gone. Massive change can occur over short periods of time. You might need a drastic effort to catalyze the change, but it is possible. At the time of writing this post, I have just finished traveling all around the world for about 16 months. The majority of my travel was in low-budget fashion. Camping, hiking, bunking in hostels, staying with friends and family. Most of the time, I lived out of a backpack. I lived simply, but lived well. I had great experiences, despite my lack of stuff. In fact, my lack of stuff enabled me to have better experiences. While I do think there is a False Hope to Minimalist Living, there is something beneficial to living with less. The JMT hike was one of the top experiences of my life. Yet, I only carried a backpack and the only expenses were food, some supplies, one night’s stay in a Yurt and $12 for a permit. Get rid of excess baggage, and notice how your quality of life goes UP not down. The drought that has struck California for the past several years is scary. During the JMT I hiked past many of the alpine reservoirs that are the origination for the water that flows to San Francisco, Los Angles and the food growing areas surrounding them. The reservoirs were almost dry. Once they are completely tapped, there is no other option for finding water. Every shower, washing of a car, watering of a lawn….all this water comes from somewhere. In the case of California, it comes primarily from the Sierra Nevada Mountains. No one else will be able to save the planet without each of us owning up to our own role in preserving natural resources while we still have them. Alison wondering, “Where did all the water go?”. This lake is usually full. 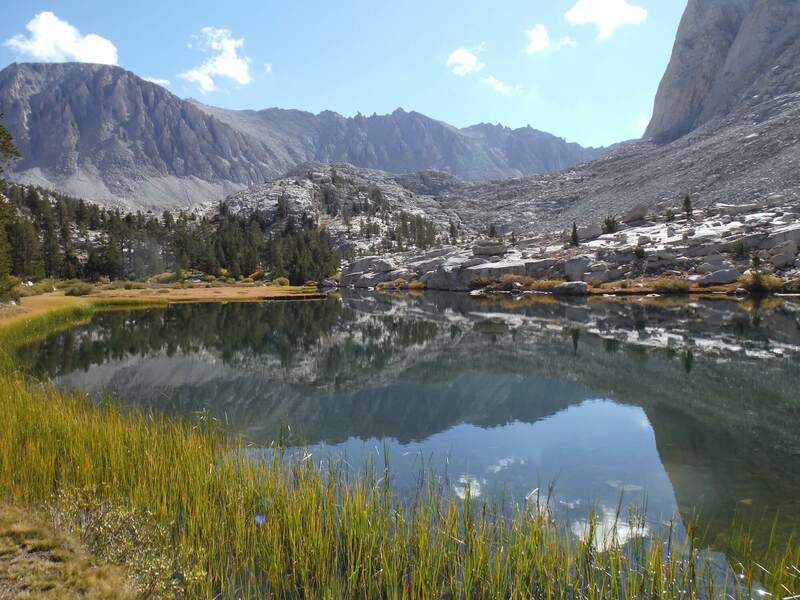 When we hiked the JMT in Sept. 2014, it had shrunk to less than half its size. For most of my life I would always day-dream about visiting some exotic country. I would carefully ration my vacation time to jet off to Ecuador, The Galapagos, Peru, India or some other exotic locale. Turns out, my experience in the Sierra’s was as epic as I could have imagined and I didn’t even need to change time zones! No matter where you live, there are epic adventures to be had relatively close to home. You can find adventure in your own backyard if you look hard enough and are open to exploring and doing new things. Even hiking through remote parts of Kings Canyon National Park (the JMT crossed through it) I would occasionally hear the roar of a fighter jet squadron in training. There are many military bases in Western Nevada that occasionally cross over the Sierra’s on sorties. However, most of the time I enjoyed a profound sense of peace and quiet on the JMT. There are few quiet spaces and places left in the world. Cells are buzzing, TVs are yapping, radios are playing, people are chatting, engines are roaring. When you find quiet spaces, enjoy them. Don’t worry about checking Facebook, it will be there when you need it! Rae Lakes, one of the many quiet places I enjoyed while hiking the John Muir Trail. Our minds are fickle. Memories change and get warped over time. Learning is lost if care is not take to remember. Why do I blog? One reason is that it provides a record of my thoughts and ideas over time. My wife and I have kept a record of our travels at www.RaviandAlison.com. It is fun to go back through a read about our experiences and re-live them through the photos. 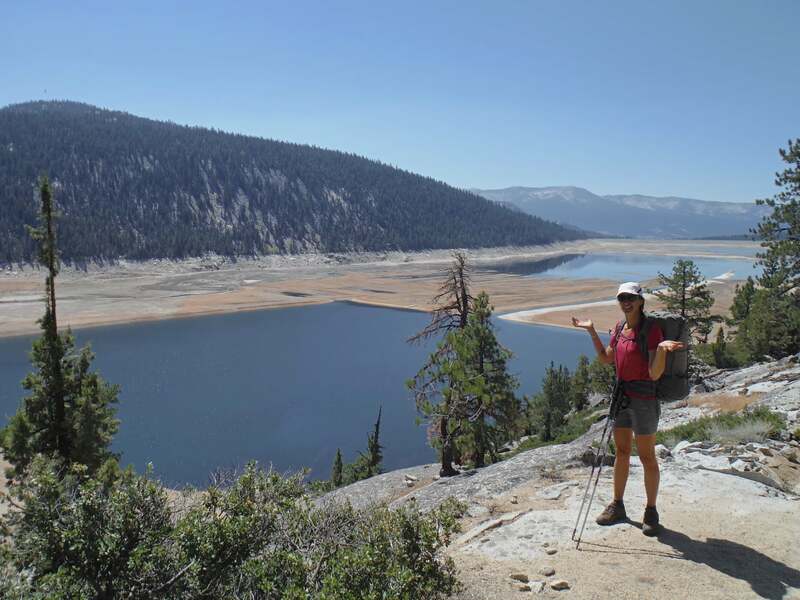 You can see our travel blog entry for the JMT hike on the blog as well. Keeping a journal is a habit of many highly successful people. You learn a lot by journaling your experiences. Even if none reads them (including you! ), your notes help your mind process what it takes in. Commit to journaling whenever you can. Life flies by in a jiffy. If you aren’t careful, years can go by without having any profound experiences. The mundane will take over if you let it. So don’t! It is up to you to make sure you plan and go after the experiences you want to have. Adventures are worth doing. Particularly the ones that scare you. After my scary experience with altitude sickness (remember how this blog post started out?) I was nervous coming back to the mountains for a longer trip. Would I get sick again? What would happen if I was stuck far from help? It turns out my worst fears never came to pass. The adventure was worth it. All the planning. All the sweaty steps taken up and over the high mountains. It was all worth it for the experience and life lessons I learned along the way. Best of all, I got to do this with my amazing wife – thanks Alison! No matter the scale of the adventure or the outcome, you will be glad you made the effort. 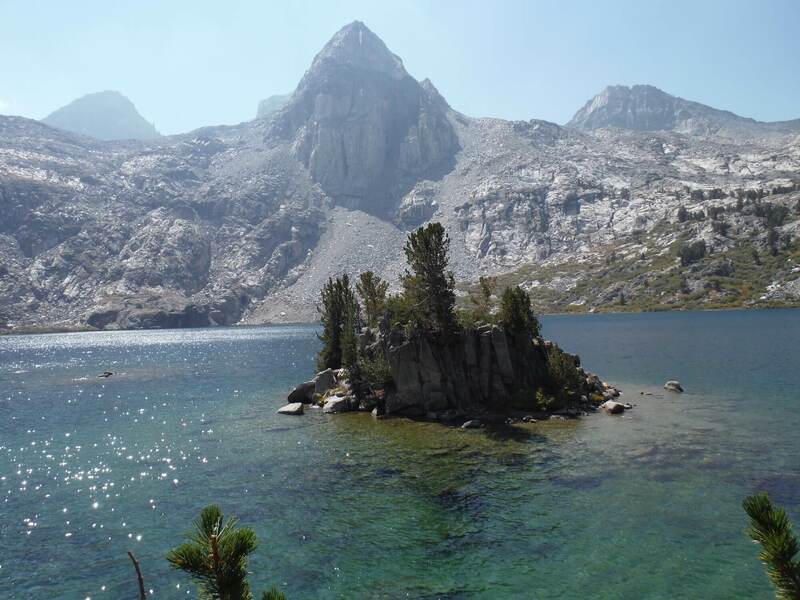 Want to hike the JMT? Lizzy Wenk wrote the best book on how to hike the JMT. I highly recommend it! Thank you for this nice article. I have experienced such kind of “Nature showed its might “, kind of a thought when i took my Scuba diving lessons. The course is made of 9 dives to learn and on the very second day , i couldn’t tolerate the pressure under water , even 15 feet. During the tasks, i drank so much of sea water, got a bit disoriented and quit the dive half way. My Dive master, a very wise man; said, ” I am upset ;, not that you didn’t do your tasks well, but you had quit”.It did really hit me hard, i borrowed the snorkel and the fins from our dive school, practice everyday in the ocean for a month, got back to my diving school and continued and got certified as a “Scuba diver”. Yes, all the points you mentioned apply to the “T”.and practical to remember , follow and live life better. And keeping a journal, i do it intermittently, should practice regularly.